The following is an article about a V2 attack on South London on 25th November, 1944. V2 launchings are recorded and it is quite a narrow window. I had just turned 3 years old and was visiting an aunt in South London. I have vivid images in my mind of that day. Whether they were first hand or the result of stories told to me later. The V2 fell from the skies while I was having lunch with my family. It is my Grandfather’s image that stays with me. Plaster from the ceiling fell into our meal. It was recounted that my Grandfather commented “dust or no dust am going to finish my dinner.” I don’t think he did. In my mind there is an image of him scarping his plate onto the garden! The next images are looking down the road to see a haze as if there was fog. Then I saw the neighbour, a middle age woman with blood on her face. My cousin Pauline, some 3 years older than me, was also there. My next image is her father with other relations boarding up the shattered windows. This is an account of a V2 falling in the area about this time. From the records of V2s it most closely fits with my knowledge of the date and place I was. A scene of devastation following a V2 rocket attack, somewhere in the south of England. In the foreground, a casualty is being carried away on a stretcher, whilst in the background, Civil Defence workers continue to search through debris and rubble, checking for any other survivors. The remains of a building can also be seen. According to the original caption, the rocket fell here “about two hours ago”. In Britain the government had taken until November the 10th to admit that the “gas main” explosions, that had mysteriously started in September, were the result of enemy rockets. Secrecy still surrounded the time and place of the explosions themselves. There was no defence against the V2 rockets so the only means of mitigating their impact was to try to feed false information to the Germans about where they were falling. By using their network of double agents British intelligence was telling the Germans that the rockets were falling north of London. It was hoped that the Germans would adjust the aim of the rockets further south. In due course the rockets’ impact was gradually seen to shift southwards, away from central London, where they had actually been accurately targeted. 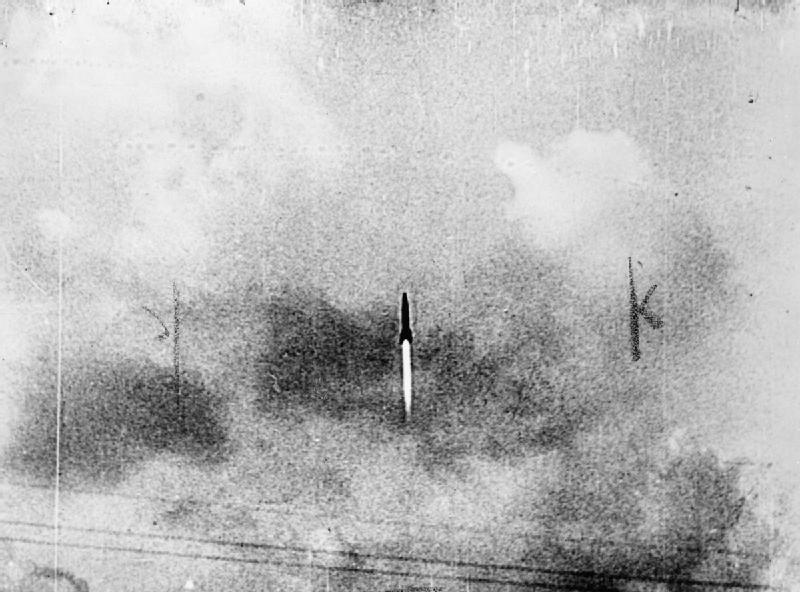 However the advantage was only marginal, some rockets still fell on London and those that fell short of it were still likely to cause casualties in the suburbs. 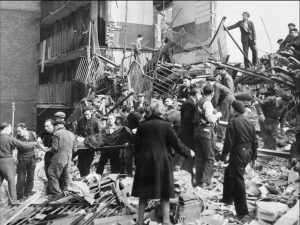 The worst V2 attack of the war happened on 25th November when the Woolworths department store in New Cross, south London was suddenly blown apart. It had been crowded with Saturday shoppers, perhaps more people than usual because the store had a supply of saucepans to sell, a rare wartime commodity. In an instant 168 people were dead or dying, with many more injured in the vicinity. The V2s always exploded with two “crumps” one quickly followed by a second. I knew immediately it was a V2 and as I looked back in the direction of the noise I saw a huge tower of smoke with all sorts of pieces turning and twisting and glinting heading skyward. At the end of November 1944 I went by tram to Lewisham to do some shopping.It was a dry,reasonably bright Saturday for the time of month and I was in quite a happy mood with my new clothes as I returned to New Cross. I alighted at the Marquis Of Granby Inn around midday and watched the tram continue into New Cross Road. I had barely taken a few steps towards my new home fifty yards away when I was picked up by a tremendous blast of hot air and flung backwards. I did not hear the explosion of the V2 rocket that landed on the Woolworths store that lay on the opposite side of the road just a few hundred yards away close to New Cross Gate railway station. For a few moments I could not comprehend what had happened until debris began to fall all around me. I could still hear nothing having been deafened by the blast. People were lying around me, some bleeding with cuts to their heads from flying glass. I managed to stand up unsteadily and then I saw the huge pall of black smoke rising from the Woolworth site. There was too much for the mind to take in, but bodies lay everywhere, some stripped of clothing. Cars were mangled wrecks,on their sides or upside down. Telephone poles lay crazily across rooftops. The tram I had been travelling in had stopped in the middle of the road. I learned later that all the passengers were found dead in their seats. My brain reeled and then I thought of the shop we had just moved into. I ran towards it, fearing the worst, but once again fate had been kind to us. The shop and others in the parade had been partially sheltered by the facade of the Town Hall which jutted further out toward the road. The shop doors and widows had stove in and external brickwork damaged but nothing beyond repair. Inside the recently equipped hairdressing salon glass lay everywhere from mirrors and shelves and cabinets. One large sliver had pierced a cubicle curtain a few inches above the head of a woman customer under a hairdryer. Once again everyone was more shaken than hurt. This entry was posted in National on February 8, 2018 by John.